OG Kush has a royal lineage of genetics stemming from one of the oldest indica strains on the planet. Due to the unique characteristics and effects of this strain, OG Kush itself became a parent and backbone to many other strains like Tahoe OG, Ghost OG, Diablo OG, and SFV OG just to name a few. As one of the most popular indica strains on the west coast, lets look into why OG Kush has gained its reputation and given rise to many other legendary strains. To understand more about OG Kush’s present day genetics, lets look into the genetics of it parent landrace strain, Hindu Kush. From the mountains of the Afghanistan/Pakistan region some of the oldest indica strains with the purest genetics have been discovered. Hindu Kush was one of those. Back in the 60’s and 70’s Hindu Kush seeds were smuggled back to the United States when cannabis was very popular. Due to its incredible genetics and relaxing effects of this indica strain, Hindu Kush became the parent of all modern day “Kush” strains like Purple Kush and of course OG Kush which have gained popularity on the west coast. OG Kush was a strain developed in America’s south when Hindu Kush was crossed with an anonymous cannabis strain. The common belief is the other cannabis strain was Chemdawg, a hybrid known for its THC content and head high. Others say it was Lemon Thai, a potent sativa also known for its head high. OG Kush is loved by so many people for its ability to deteriorate the stress while delivering a euphoric trip. This is a classic effect of potent indicas that are bred into balanced hybrids by providing both “head highs” and “body highs”. This cannabis strain has been used to treat pain, depression, anxiety, has a notable effect on treating Alzheimer’s disease and helping to cope with PTSD. Due to its ability to relax the body while delivering euphoria, its an ideal strain for stress relief. The flavor of OG Kush has this signature combination of an earthy and woody taste (fitting of a strain with ancient heritage) joined by a refreshing scent of pine and lemon. The adverse effects of OG Kush are typical of many other cannabis strains like dry mouth and red eyes so don’t expect anything out of the ordinary. This strain has been bred longer than most so it has more stable genetics. Our friends at Leafly have made a great video discussing some of the details of OG Kush in their Leafly Strain Spotlight series. OG Kush is very dynamic and can be grown both indoors and outdoors. For quick instructions on how to sprout cannabis seeds, visit our seed germination page. Once your seeds are germinated maintain an environment temperature of 65 to 85°F (18-29°C) allowing it to grow/bloom healthily. If it become top heavy, set up some wooden stakes to prevent the plant from breaking. It also helps to keep the canopy trimmed. Feeding OG Kush with large amounts of calcium and magnesium are the top-notched priority when deciding to cultivate such strain. Another pro tip is to use composted tea in the soil which helps strengthen the plant immunity to mildew. While OG Kush has very unique properties no strain is perfect. It’s vulnerable to mildew growth but this can easily be combated/prevented by ensuring proper air flow by keeping the canopy trimmed. This allows air to flow through the leaves making it hard for mildew to grow. You can also use a diluted water based spray that will prevent mold, mildew and pests naturally by combining 1 teaspoon of neem oil (natural Ayurveda medicinal oil) per liter of warm water. To combine the two use a blender to emulsify the mixture before spraying. The added benefit is that this keeps your OG Kush plant healthy with clean, smokable flowers all without the use of harsh chemicals. OG has an average flowering period of about 8-10 weeks. So by sprouting your seeds in late July to early August and growing your plants from August through October, you should have a beautiful plant ready to harvest in mid-late October. Here at Sonoma we carry 2 versions of the classic OG Kush strain but we’ve done something great both of them. For both versions, we made sure the genetics have been feminized, meaning that when you grow OG Kush from Sonoma, you’ll always get female plants that will produce flowers. 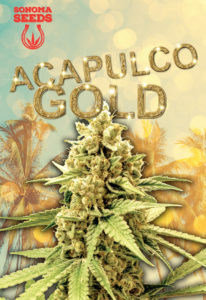 The first version has been bred to produce more flower per plant and contain more THC compared to others. We call this Super OG Kush and it flowers it 8-10 weeks. For second version, we did something even better. We introduced ruderalis genetics making it an autoflower. This means that during the flowering period there is no light triggering process that needs to be done manually to cause the plant to grow buds. Our OG Kush Seeds will produce plants that grow buds automatically and this one maintains the THC levels you all know and love.